We are so proud of Lake Shore graduates Shannon Marsh and Ashley Romanowski for their soccer prowess. Earning a spot on the second team is Findlay sophomore Shannon Marsh, the first women's soccer player from Findlay to earn CCA all-region since 2012. Read more at http://athletics.findlay.edu/…/2018…/releases/20181114i9ww4n. 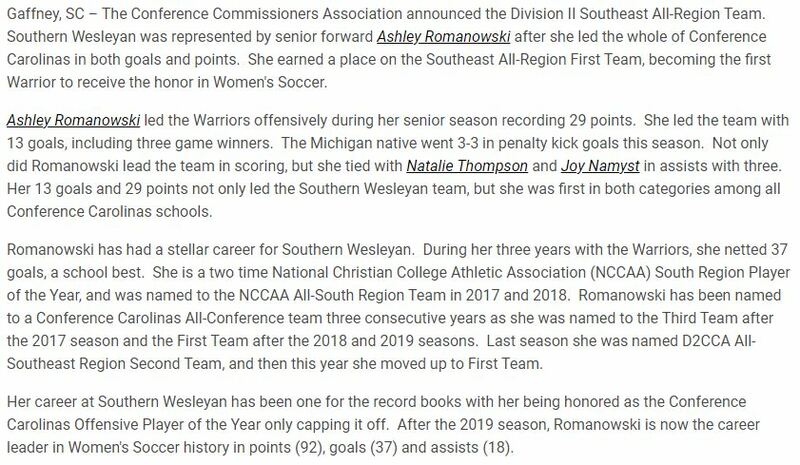 Southern Wesleyan forward, Ashley Romanowski, notched a slot on the All-Region Second Team, becaming the first women's soccer player in school history to receive the honor. Read more athttps://www.swuathletics.com/…/2018…/releases/20181114m27myq.